The cathedral is in the process of a period of restoration, and in the past couple of days has had sixteen bronze statues removed from the roof area in recent days to facilitate work. The fire appears to have started in the roof where work is taking place. 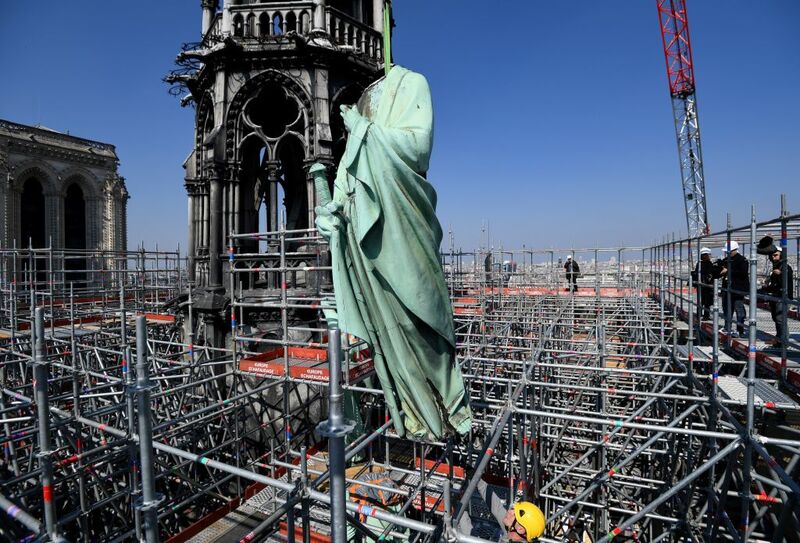 Sixteen bronze statues briefly took to the skies over Paris after they were removed from the Notre-Dame cathedral to undergo restoration work. 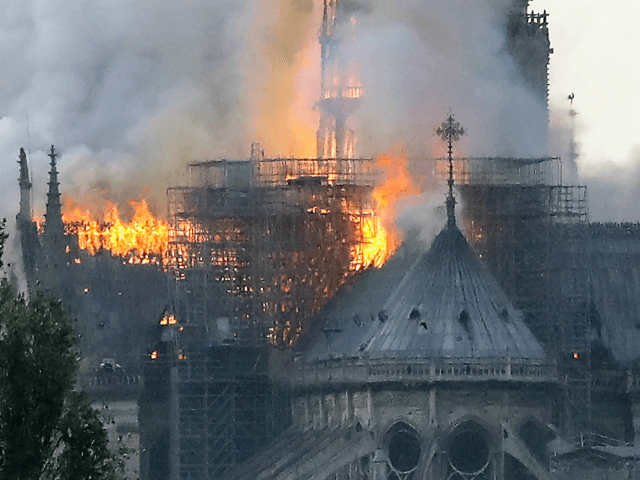 Tourists at the world-famous landmark were left stunned on Thursday as the statues — representing the 12 apostles and the four evangelists from the New Testament — were lifted off the spire of the cathedral by crane. 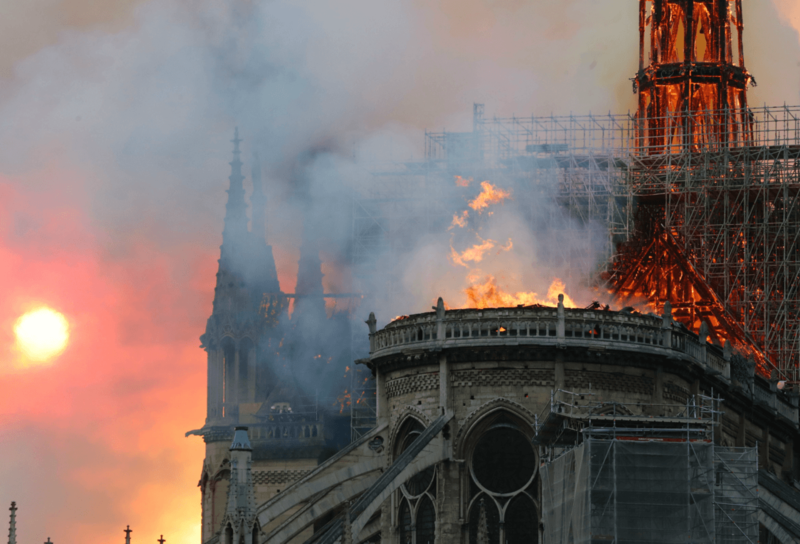 “What’s unique is that it’s the first time we’ve seen them up close since they were set up by Viollet-le-Duc in the 1860s,” Marie-Helene Didier, who is in charge of the renovation work, told AFP. 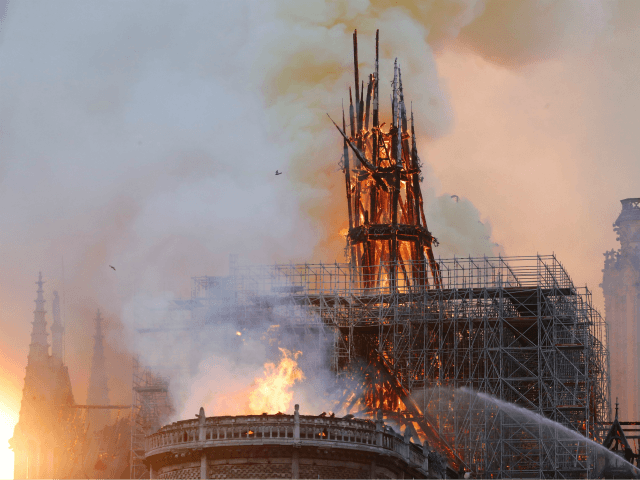 Its spire, like the rest of the gothic edifice, is undergoing a 11-million-euro ($12.4-million) overhaul financed by the French state to repair damage inflicted by time, pollution and the weather. 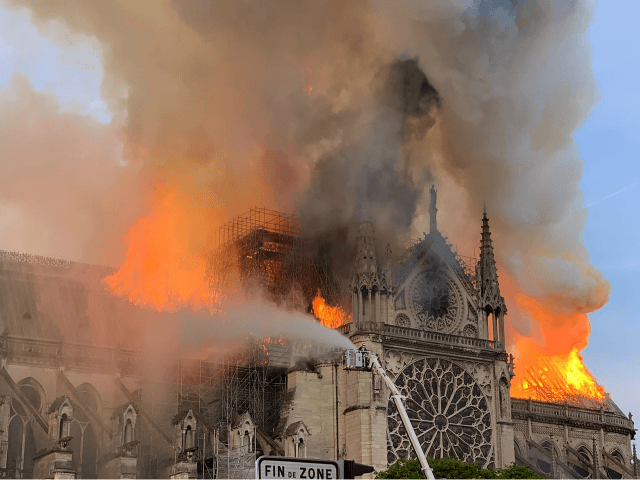 The statues will be put on display inside the cathedral and will travel two-by-two to a specialised restorer in the Dordogne area of southwest France. Once all have been renovated, they will be put back to their position staring out over the City of Light in 2022. 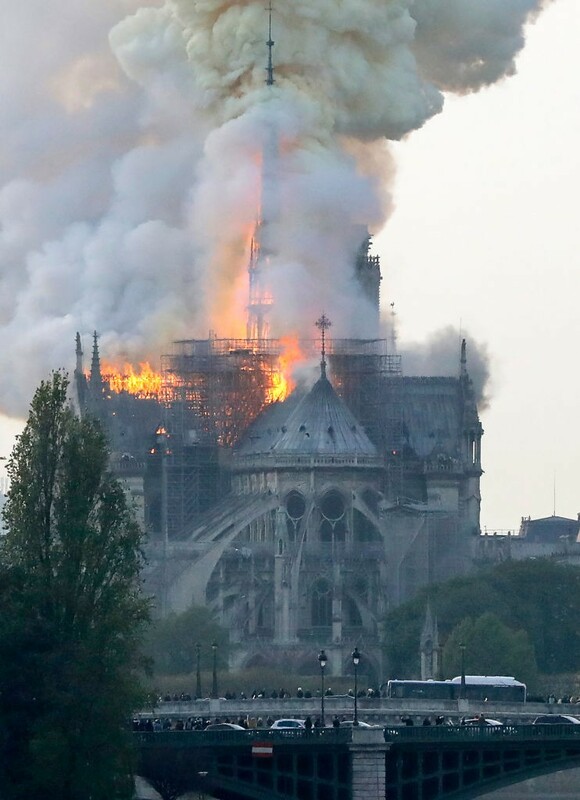 The spire mentioned in the report now appears to be a complete loss, and firefighters at the scene say part of the roof has now collapsed. Considered one of the finest examples of French Gothic architecture, the Notre-Dame de Paris, on the bank of the Seine river, dates back to the 12th century and is one of the major landmarks of Paris is recognised by its flying buttresses and its large, round north rose window. The cornerstone of the cathedral was laid in 1163 in the presence of Pope Alexander III. Images taken by press photographers from the roof of the church just last week show the significant extent of the restoration work taking place on the nearly 700-year old structure. Scaffolding can be seen spanning the roof in preparation for the removal of 16 copper statues of the Apostles ahead of their restoration. The statues were ‘flown’ out through the use of straps and a crane on Friday. 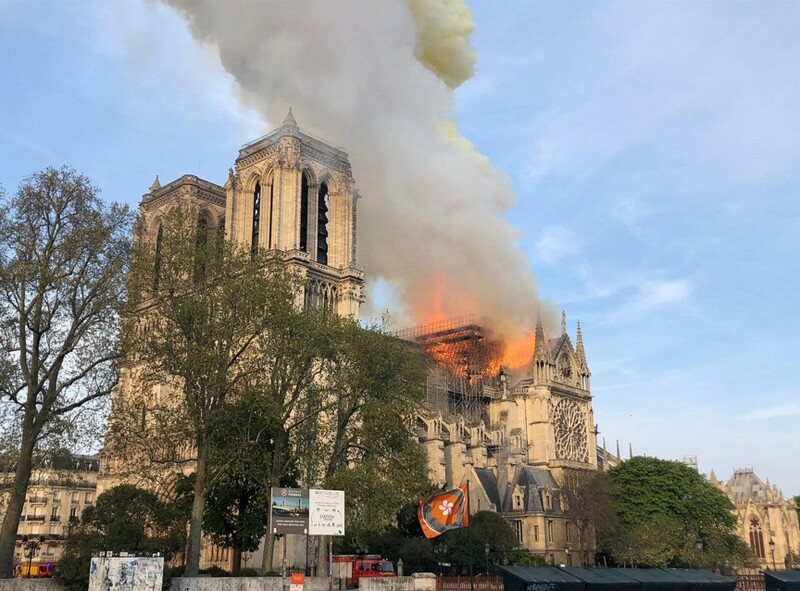 Firefighters believe the blaze is “potentially linked” to the renovation work of the building, reports Le Figaro. 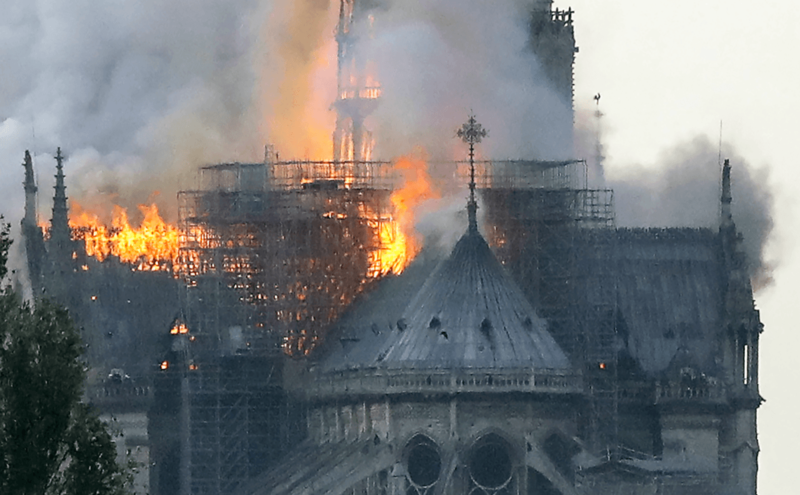 Restoration work can be a particularly vulnerable time for historic buildings when power tools and other potential sources of combustion come into close contact with dry timbers and other building materials. The United Kingdom suffered the near total loss of a significant historic building, but on a smaller scale, in 2017 when the building thought to be the oldest hotel in the country — and one of the oldest in the world — burnt down during building work taking place on another historic building next door, which spread.